A lot of ink has flowed over the question how to define Hinduism. There is no other religion for which the question of definition is so difficult. A Roman Catholic could be defined as a person who is baptized by a priest ordained within an apostolic succession going back to Jesus, and who accepts the Nicean Creed and the authority of the Bishop of Rome. A Muslim is defined by the Muslims themselves as one who has affirmed the Islamic creed: that there is no god beside Allah and that Mohammed is Allah’s prophet. A Buddhist is one who has taken the triple refuge into the Buddha, his teachings and his community. If we think of Hinduism in a limited context, we may think of it as a religion and then whoever is born in that religion would be considered a Hindu, i.e. a Hindu by birth or a Janma Hindu. However, in reality Hindu Dharma is an attitude; and it is far more than a religious ideology. In the holy text the Merutantra, the word ‘Hindu’ is defined as ‘Hinani Gunani dushyati iti Hindu.’ Meaning that which destroys or dushyati the inferior Raja-Tama components or gunas (subtle spiritual components) is a Hindu. Thus, to be a Hindu is to follow a way of life that enhances the spiritually pure Sattva component and Sattva predominant qualities like love, humility, tolerance, courage, expansiveness, etc. and overcomes the spiritually impure Raja-Tama predominant attitudes like anger, attachment, jealousy, greed, lust, pride etc. The three subtle basic components of Sattva, Raja and Tama are the very fabric of creation. Unknown to modern sciences, they permeate through all living and non-living, tangible and intangible things. The vibrations emitted by anything are dependent on its predominant subtle basic component. They also influence the behavior of all things. The proportion of these components in human beings can only be changed by spiritual practice. Karma Hindu -> is a Hindu by his deeds and qualities or spiritual components. Since to be a Hindu is an attitude, a Karma Hindu is a true Hindu. He is Hindu by action and thought, a follower of Dharma and spreads Dharma, which is a sÄttvik or spiritually pure way of life. How is Hinduism unique from other religions? Hinduism cannot be neatly slotted into any particular belief system. Unlike other religions, Hinduism is a way of life, a Dharma, that is, the law that governs all action. It has its own beliefs, traditions, advanced system of ethics, meaningful rituals, philosophy and theology. The religious tradition of Hinduism is solely responsible for the creation of such original concepts and practices as Yoga, Ayurveda, Vastu, Jyotish, Yagya, Puja, Tantra, Vedanta, Karma, etc. How and when did Hinduism originate? 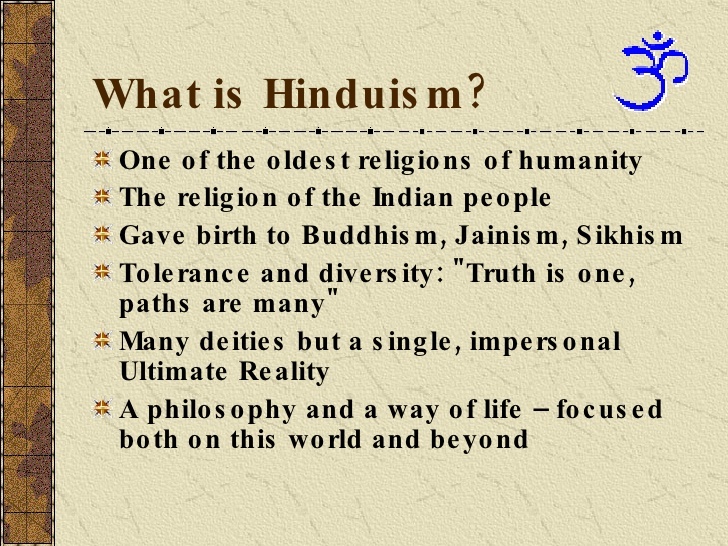 What are the basic tenets of Hinduism? It also believes in truth, honesty, tolerance, non-violence, celibacy, cleanliness, contentment, prayers, austerity, perseverance, penance, and pious company. What are the major Hindu deities? Hinduism believes that there is only one supreme Absolute called “Brahma”. However, it does not advocate the worship of any one particular deity. The gods and goddesses of Hinduism amount to thousands or even millions, all representing the many aspects of Brahma. Therefore, this faith is characterized by the multiplicity of deities. The most fundamental of Hindu deities is the Trinity of Brahma, Vishnu and Shiva – creator, preserver and destroyer respectively. Hindus also worship spirits, trees, animals and even planets. Who is a Hindu and how to become one? 1. One who accepts thr Vedas, Vedaangs, Puraanas and related sects and one who has been born in a traditionally Hindu family. 2. One who sincerely accepts the above is also called a Hindu by initiation – Deeksha Hindu. 3. One who does not accept either of the above, but has been born to Hindu parents is merely Hindu by birth – Janma Hindu. The best definition is if both factors are present, but if only one of the factors is present, I consider the definition of Hindu by initiation to be superior. Should be called Hindu. This is an expansive definition of the word Hindu. Thus, Hindu is a spiritually pure (Sattva predominant) attitude. It means to be a seeker (saadhak) of the divine. Sorry mistake, meant with Brahma not mi Brahma! Thinkin german and writin english can cause bhrama!